Gum disease is caused by bacteria found in plaque; it develops as the plaque begins to reach the gum line. Gum disease causes the gums to pull away from the teeth, creating spaces called pockets. Root planing and scaling are methods used to provide deep cleaning below the gum line. These techniques are used by dentists to help treat gum disease. Gum disease is caused by plaque, a sticky film made up of bacteria that covers the surface of the teeth. Plaque is constantly being formed on the surface of your teeth. With proper oral hygiene bacterial growth can be limited, without proper oral hygiene on the other hand, plaque can infect your gums. This can lead to inflammation. When this occurs, your gums will slowly pull away from your teeth, creating spaces called pockets. These pockets allow the plaque to go deeper down your teeth where it cannot be reached with simple brushing. If it stays untreated, it can lead to tooth or bone loss. Early detection and treatment will help preserve the structures below the gum line from gum disease. But if the pockets between your gums and teeth are too deep, scaling and root planning might be the only treatment options left in order for you to avoid tooth loss. The Journal of the American Dental Association in their July 2015 study has stated that root planning and scaling are ideal for patients with chronic periodontitis. Periodontitis is an advanced form of gum disease that is far worse than gingivitis. This condition also affects almost 50% of adults above the age of 30 in the United States. What takes place during scaling and root planing? Both of these treatments are used for deep cleaning. Scaling is done by letting your dentist remove the plaque and tartar that has accumulated above the gum line and below it, inside the pockets. After the hardened plaque has been removed, your dentist can start the process of root planning. This process is done by smoothing out the roots of your teeth so that your gums can easily reattach to your teeth. Both these treatments have to be done using a local anesthetic; they may also require more than one visit to complete. 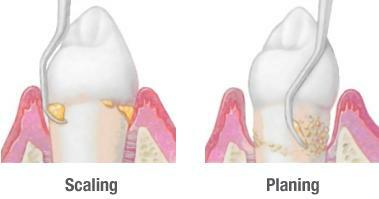 After scaling and root planing, you may experience pain on your teeth for a few days. You can also experience sensitivity for a week, and it is also possible for your gums to bleed, feel tender, and become swollen. Medications as well as mouth rinses will be typically prescribed by your dentist to help prevent infections as well as to help you deal with pain. Your dentist can also insert a subantimicrobial dose of doxycycline directly into the pocket that was cleaned to help hasten your healing. You will be required to see your dentist after a few days in order to assess how well your gums have healed and also to allow the dentist to measure the depth of your pockets. If the pockets are still too deep, more treatments might be required. At home, patients are required to maintain good dental care to help prevent the gum disease from worsening or recurring. Patients have to brush their teeth twice a day with a soft-bristled tooth brush, they have to floss daily, and they need to eat a nutritious and balanced diet. They should also avoid tobacco use, and they must see their dentist regularly.